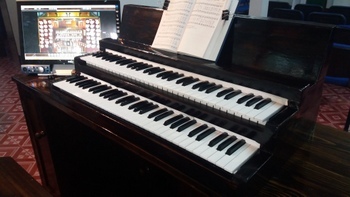 New Organ and New Prayer! On Monday we took delivery of our newly assembled organ keyboards – they won’t make the organ sound any different, but they will help our organists to play – especially making it easier to hold the music in place. Nancy will be playing at the 9:15 a.m. service this week, and Anders will be playing at the 11 a.m. services in future weeks. Let us make a joyful sound to the Lord! We also had our first virtual prayer meeting yesterday. This was a very moving time of prayer for those involved. If you’d like to join us at 6 a.m. next Wednesday for half an hour, please let me know! 7:30 pm Maundy Thursday Service. This will be a time for quiet, candle-lit, contemplation including Taizé chants and the washing of one another’s feet. 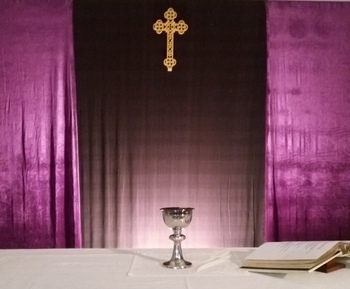 11 a.m. Easter Sunday – A joyous Eucharist to proclaim Christ’s resurrection. This will be followed by an Easter Potluck Lunch and Easter Egg hunt! This Sunday’s readings are Isaiah 55:1-9, 1 Corinthians 10:1-13, and Luke 13:1-9, and we will be singing the hymns The Lord’s My Shepherd, I heard the Voice of Jesus say, My Song is Love Unknown, and Tell Out My Soul! The readings can be found via this link! This is part of our Gospel reading this week and, as well as being one of the instances where Jesus uses female imagery, it emphasises how much God cares for us! So the LORD is our chicken and we are God’s chicks, his children! Perhaps it reminds us too of the eggs of approaching Easter – that symbol of new life! It is God’s warmth that enables us to hatch spiritually! Meanwhile, we are thinking of starting a Wednesday Night virtual discussion group or prayer meeting. This will be an online video meeting via Skype beginning at 7pm and lasting maybe half an hour. It means people with young children, or those who live out at Doi Saket or Hang Dong can also be involved. If you are interested, send me an email. There will be no 9:15 a.m. service this week, but at our 11 a.m. service, the readings will be Genesis 15:1-18, Philippians 3:17-4:1, and Luke 13:31-55, and we will be singing the hymns The God of Abraham Praise, Be Still My Soul, I will offer up my life, and In Christ alone my hope is Found! The readings can be found via this link! We had a very peaceful and moving service yesterday, as we marked Ash Wednesday and the beginning of Lent at All Saints. Thanks to all who made it such a good time together. This week will be the first Sunday in Lent and we will be looking at Jesus’ temptation in the wilderness. Mark Crawford will be preaching. This Sunday’s readings are Deuteronomy 26:1-11, Romans 10:8-13, and Luke 4:1-13, and we will be singing the hymns O Worship the King, Forty Days and Forty Nights, Take My Life and Let it Be, and What a Friend We Have in Jesus! The readings can be found via this link! There will be a church council meeting at 2pm this Sunday. Today is Shrove Tuesday – the day when we ask for our sins to be shriven – forgiven and absolved – before Lent begins. It is also known as Pancake Day in the UK, and Mardi Gras in much of the rest of the world. 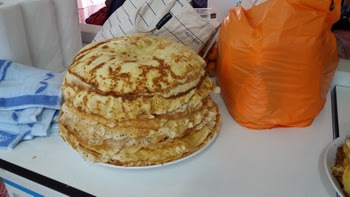 On Sunday, twenty-four of us shared in pancakes and lots of sweet toppings to mark this putting away of luxury before the traditional season of fasting. Tomorrow we will have our Ash Wednesday service, beginning at 7 p.m. The service will last around 45 minutes and will include the imposition of ashes. I hope you can join us as we draw near to God in the knowledge of God’s love and care! Next week we will enter the season of Lent, and at All Saints we will mark this with our Ash Wednesday Service. The service will be at 7 p.m. on Wednesday 10th February. 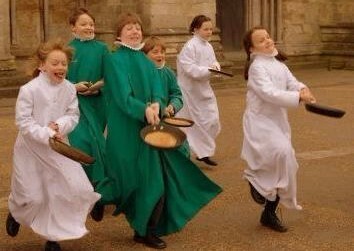 However, the British tradition is to have pancakes the day before – Shrove Tuesday is known as “Pancake Day!” All Saints will mark this with a special pancake potluckfollowing the 11 a.m. service this Sunday. Bring toppings or ready-made pancakes to microwave – see Caitlin for more details on camacongo@gmail.com or call 0873 750 317, or just come along with your food! Also, for council members, advance notice that we will have our next church council meeting at 2 p.m. on Sunday 14th February. This week our readings are Exodus 34:29-35, 2 Corinthians 3:12-4:2, and Luke 9:28-43, and we will be singing the hymns All Creatures of our God and King, Swiftly Pass the Clouds of Glory, For the Bread Which You Have Broken, and Christ is made the Sure Foundation. The readings can be found via this link! Our sermon is entitled What is that? Great Decisions is an adult discussion series focused on challenges to America and produced each year by the US Foreign Policy Association. Each session includes a brief reading, a video & discussion. Session 1 video is “The Middle East”. I have led GD groups at Baylor and elsewhere. If you are potentially interest in participating, send me an e-mail (Gayle_Avant@Baylor.edu) quickly. No obligation. A group may meet at All Saints.